1 medium size Korean radish, salt, garlic, sesame oil, vegetable oil, shredded red pepper (silgochu). Cut radish into thin strips. Make about 5-6 cups. Heat up a pan and add the radish strips, 1tbs vegetable oil, 1 ts salt, and 1 clove of minced garlic. Sauté for a few minutes. Add ¼ cup of water and close the lid. Lower the heat and simmer for 8-10 minutes. Turn off the heat. Add a few drops of sesame oil and mix it gently. Transfer it to a serving dish and garnish with shredded red pepper. Posted on Monday, January 19th, 2009 at 11:34 am. Last updated on April 26, 2015. Posted November 24th, 2011 at 11:02 pm | Log in to reply. I had a question about a side dish which i like a lot. It’s really thin slices of dikon into rounds and they’re pickled. I think it’s like this cambodian pickle dikon we make, but it dont smell like dikon just the vinegar. I’m not sure how to make it. I was wondering if you knew how to make it. Posted November 26th, 2011 at 8:18 am | Log in to reply. Posted August 27th, 2011 at 5:05 pm | Log in to reply. 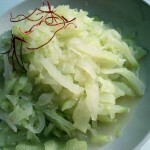 i have a question about aside dish it looks like a shredded white radish but tastes pickled do you have a recipe for this? thank i love your website! Posted August 28th, 2011 at 10:28 am | Log in to reply. It sounds like musaegchae (radish salad)! https://www.maangchi.com/recipe/musaengchae Skip hot pepper flakes in the recipe. Posted May 3rd, 2011 at 5:34 am | Log in to reply. As this this is my first time to see your column, may I know the past recipes you have shown ? Actually, I am already expert in making kimchi like napa, radish and cucumber. In fact, I never out of them. If not, I just better follow on to your next recipe. Hope to see you soon. Posted May 3rd, 2011 at 6:13 pm | Log in to reply. Posted May 2nd, 2011 at 6:24 am | Log in to reply. Since cooking is my very best hobby, I would like to share some that I may know . One best that I like is Korean food. I have tried some for which I did them successfully and even serve them during parties and gatherings This latest one from your recipe, I did made and the kids love it so much. I made some pork bbq and made the cooked radish as side dish. I don’t have to make separate dippings. Our meal just did finished satisfyingly! Posted May 3rd, 2011 at 6:14 pm | Log in to reply. ” … kids love it so much..” Great news! Happy cooking! Posted April 8th, 2011 at 11:19 pm | Log in to reply. I was planning to make musaengchae and ran across this recipe. Yum! I’m glad I tried it–so few ingredients, but very tasty. Posted April 9th, 2011 at 8:43 am | Log in to reply. Yes, when the radish is cooked, the taste turns sweet and gives a good flavor. 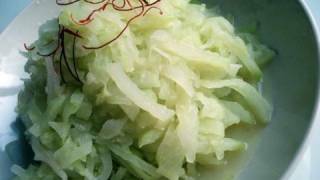 It’s non spicy and soft, so it will be a good side dish for young children. Posted March 14th, 2011 at 6:15 am | Log in to reply. Posted June 15th, 2010 at 10:45 am | Log in to reply. I am absolutely won over by the simplicity of your recipes for Korean dishes! In fact, I am going to try it this weekend! Currently, i am trying to make a low-calorie dish for my friend for her upcoming training exercise regime and i realized quite a few dishes require vegetable oil to do some light cooking. So every calorie count =). So my question is, is there any alternative i can use besides using oil to do the cooking? If i use soy sauce, would it be ok? But it might change the taste if soy sauce is used in place of the vegetable oil for this dish. Thank you for the great recipes again! Posted June 15th, 2010 at 10:02 pm | Log in to reply. Skip vegetable oil. It will be delicious too. Posted June 16th, 2010 at 9:09 am | Log in to reply. Will i still be able to saute the radish even without the vegetable oil? By the way, if i did not remember wrongly you had one page about various ways of cooking soy bean. Am i right? Can’t seem to find it now, appreciate it if you could provide me the link! Thanks! Posted June 20th, 2010 at 9:49 am | Log in to reply. Btw, i managed to saute using onions and a bit of water to help stimulate the frying. It is a good alternative for those who want to saute without using any oil. Posted March 1st, 2010 at 11:57 pm | Log in to reply. Can you store this in the fridge? do you have to warm it up before you eat it? Would it be good to eat as side dish with Bi Bim Bap? Posted March 2nd, 2010 at 11:29 am | Log in to reply. yes, you have to keep it in the fridge. I like cold muwoonamul, so I don’t warm it up.Of course you can add this to your bibimbap. Posted April 5th, 2014 at 3:23 pm | Log in to reply. Posted February 17th, 2010 at 10:35 pm | Log in to reply. Oh, this looks lovely! Like someone else I made kimchi but had some radish left over. Thanks! Posted February 19th, 2010 at 7:54 pm | Log in to reply. yes, this is my favorite recipe! I feel like eating it now! lol, no radish at home though. Posted August 5th, 2009 at 11:14 pm | Log in to reply. Do you think it will be good with a sprinkle of hot peppers flakes instead of the hot pepper strips? Posted August 6th, 2009 at 7:48 am | Log in to reply. If you want, you could use hot pepper flakes! Posted August 7th, 2009 at 12:26 am | Log in to reply. I made this today and it was soooo good! Posted August 7th, 2009 at 5:56 am | Log in to reply. Yeah, muwoonamul (cooked radish side dish) is very easy to make and delicious. Posted March 31st, 2009 at 9:43 pm | Log in to reply. Posted January 29th, 2009 at 11:35 pm | Log in to reply. yes, you will love this vegetable dish. Posted January 29th, 2009 at 9:40 am | Log in to reply. thanks for your comment on my blog, maangchi! Posted January 19th, 2009 at 3:21 pm | Log in to reply. This recipe was originally posted on January 19, 2009 at 11:34 am by Maangchi. It was last updated on April 26, 2015. The video was watched 63,562 times on YouTube & has 273 likes!